As we were fishing our way through the TU Top 100 book, friends would ask us “What is your favorite river?” After a lot of “ummm ummm’s”, we would usually tell them “it depends”. We talk about the fishing experience, the “vibe” from the fishery and community, the scenery and of course, the fishing. Well, after fishing all of the Top 100 streams, we can confidently say, that if the measure combines the quantity, quality and diversity of fish, we have a #1….. the Kanektok River. 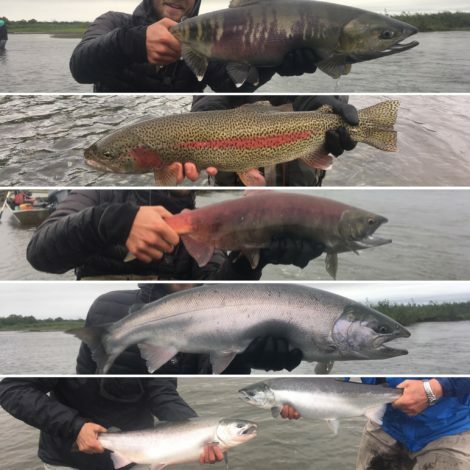 The other rivers in Alaska shined as well but we sure hit the jackpot during our week on the Kanektok with the guides from Alaska West. To be honest, just getting to Alaska West was an adventure. 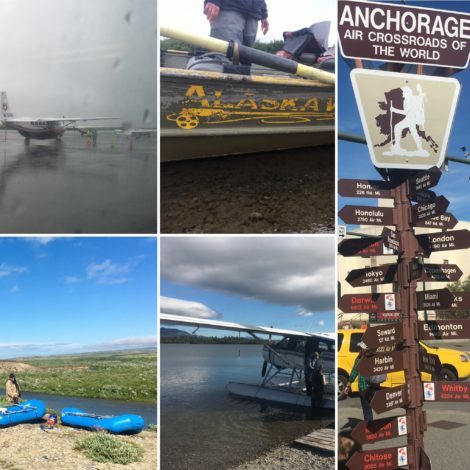 For us, it started with boarding the Ravn Airlines “Nanook” prop plane for a flight from Anchorage to Bethel, a small village about 1.5 hours away. 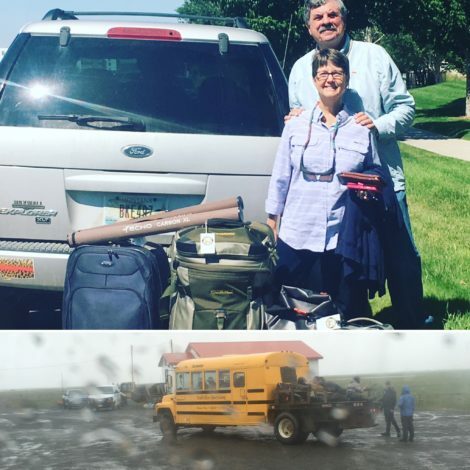 We had to fly into Bethel because there are no roads connecting Anchorage and Bethel. From Bethel, we got on a much smaller single prop plane for the stretch from Bethel to the little native village of Quinhagak. When we boarded the plane to Quinhagak, the pilot grabbed a rubber chicken and choked it for luck…. before handing it to Barb who sat right behind him. After landing on the runway and taxiing to the “terminal” (very small building) we jumped in a bus, drove down to the Alaska West boats and jetted up to camp. 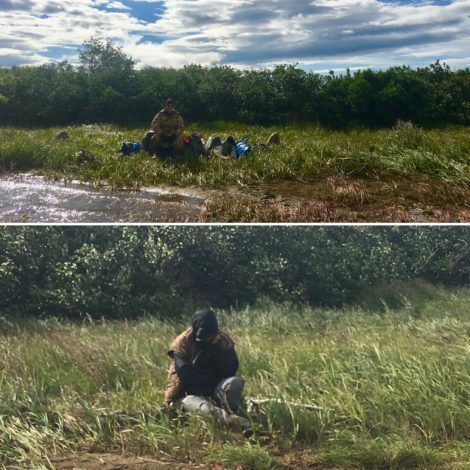 Alaska West is a tent camp, based about a 30 minute boat ride up the Kanektok River from Quinhagak. As you can see from some of the drone footage we shot while there, it’s in a remote area, again no roads anywhere, small trees and tundra surround it but most importantly, it sits directly on the Kanektok River. The camp only has two permanent buildings…. the “drying” building and the kitchen. All of the other structures are tents…. the lounge (with the flags on top), the dining hall, the showers and of course, the sleeping tents. Our tent was named, Chum. Important to note, the bathrooms were port-a-pots. While it might sound like roughing it, the camp was really quite nice with great heaters in the sleeping tents, a kitchen team that served us awesome meals, and the “drying” tent which was for our waders to dry after fishing each day. The “drying” tent was like a sauna and was greatly appreciated as we wadered up each day before heading to the river. Each day, we all walked down to the river, assembled in our assigned boats for the day with our guides (see Kanek “Talk”), and headed up, or down river. We fished all the way from where the Kanektok met the Bering Sea (we couldn’t see Russia, but, it was out there somewhere) upstream to where the Togiak Preserve boundary sign was posted. Each day, we experienced all sorts of scenes along the river, from amazing views, to small channels teaming with trout, dolly varden and even grayling, to the main channel where we found some very very big salmon (we were hunting for silvers). We were introduced to the term “tundra turd” (pic in video will be obvious) as we navigated the river. When we caught our limit of silvers, we’d head back to camp and drop them off for processing (and smoking). We were often met by the camp mascot, Chum (see pic with Cole holding him). We even had a “shore lunch” of freshly caught dolly varden where we had another chance to launch our drone (“River Eagle”) to catch some amazing vistas. I wish I could tell you how many fish we hooked and how many we landed, each and every day, but that would be an impossible task, because we were constantly being put on fish. What we’ve tried to do is share with you some pics and videos of both hooking/fighting fish as well as the fish themselves. As you watch, you’ll understand why we are so enamored with this river. We promise you’ll enjoy our Kanektok River Ramble. 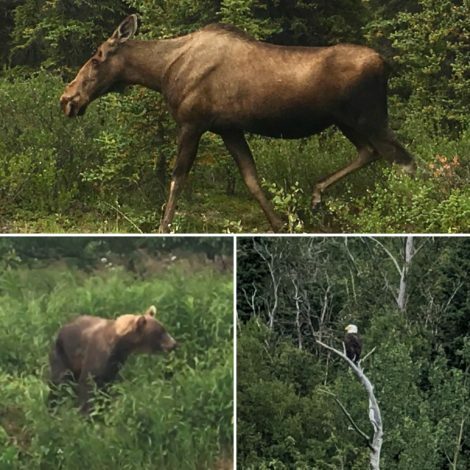 And yes, we are already planning our trip back to Alaska West and the Kanektok River.